TORONTO, ONTARIO, January 15, 2018 - The roads of Avalon, the mystical paradise that inspired Toyota’s flagship nameplate, have likely never seen a mid-premium sedan like this. Safe to say, neither has the North American International Auto Show. Until now. Underpinned by a Toyota New Global Architecture (TNGA) platform, and powered by a fuel-efficient 3.5-litre V6 powertrain, the 2019 Toyota Avalon embodies consumers’ overarching desire for high-caliber, design-centric, technologically-savvy modes of attainable, premium transportation. To its menu, Avalon mixes a bevy of Toyota-firsts such as standard Apple CarPlay and Dynamic Auxiliary Turn Signals, available authentic Yamaha wood and aluminum cabin accents, and Engine Sound Enhancement. In addition, drivers will appreciate the standard passive and active safety benefits through Toyota Safety Sense P (TSS-P). For its fifth generation, Avalon received an all-encompassing makeover by Toyota’s design, engineering, and manufacturing entities at Calty Design Research Inc. (Calty) in Ann Arbor, Michigan; Toyota Motor North America Research and Development (TMNA R&D) in Saline, Michigan; and Toyota Motor Manufacturing, Kentucky (TMMK), respectively. The all-new Avalon development is spearheaded by Chief Engineer, Randy Stephens, and Calty President, Kevin Hunter. The teams minded two keywords throughout their development paradigm: Authenticity and Exhilaration. Both were applied in every area of Avalon’s sophisticated essence, and throughout the two available grades: the athletic XSE (all-new) and the more opulent Limited. Avalon’s dimensions echo the seductive physiques of high-dollar premium vehicles. Its cabin, however, keeps its characteristic low-profile heritage by extending the rear cabin farther by another 178 mm, and elongating side quarter glass and downward tapered C-Pillar by 56 mm. To finalize the ingenious profile, engineers and designers implemented a 8 mm radius corner – the tightest ever for Toyota – fore of the steep pillar. Avalon’s various height measurements have been trimmed: overall (by 25 mm to 1,435 mm), cowl (by 30 mm), and rear deck (by 20 mm). So too have front and rear overhangs (down 9 and 25 mm, respectively), as well as wheelbase (up 50 mm). Along with its wider front (up 11 mm.) and rear (up 37 mm) tracks, and width (up 20 mm to 1,850 mm. ), Avalon’s premium aura and sporty stature are further emphasized. Nowhere is Toyota’s “Under Priority” brand identity (a direction that prioritizes aerodynamic efficiency, cooling, and pedestrian protection) clearer than at Avalon’s stunning face. Available slim all-LED projector headlights simultaneously speak to its sportiness and elegance. They’re but a piece of the façade’s compelling story, though, that depicts the intersection of three-dimensional surfaces and assorted functions – the aluminum hood’s longitudinal lines and lightweight build; the wide, modern grilles built for air-slicing sleekness; tangential vents at its lower portion crafted for the effective direction of passing air across the front tires and along Avalon’s buff flanks. The chiseled doors achieve a deeper character line thanks to TNGA prototype stamping applied at TMMK. Simple horizontal character lines slice across the backside, at the top, centre, and lower portions. Its 1,850 mm width, in effect, is highlighted substantially by the distinct sectioning. Connected LED tail lamps shaped in a three-dimensional, “aero fin” style differentiate the landscape from the current iteration. They integrate backup, stop, and turn lights into a single harmonious, fluid form. Differences between the grades are clear. A dark gray front grille with chrome border, for instance, is a telltale sign of the Limited version. So too are the machined-silver LED headlight bezels, body-colour rear-view mirror housings, and unique 18” wheels. Chrome badge letters, as well as dual exhaust with chrome tips individualize the grades. A more aggressive attitude is worn by XSE. A piano black mesh grille, machine-finish and 19” Gloss Black wheels, as well as black outer mirror housings are special to the grade. Headlight bezels – also in black – create an engaging mystique never before possessed by Avalon. Rear traits include trunk lid spoiler and badging in black, and a grade-specific lower diffuser set above and between quad tailpipes. The lineup adopts two all-new Toyota colors: Opulent Amber and Grey Harbor Metallic. Carryover colors include Celestial Silver Metallic, Midnight Black Metallic, and Parisian Night Pearl; new-for-Avalon options include Platinum White Pearl and Ruby Flare Pearl. For Limited, each headlamp is comprised of thin lighting modules – one for low beam, another for high – plus, an Adaptive LED Cornering lamp and a Dynamic Auxiliary Turn Signal. Each is a Toyota First. The innovative cornering lamps enhance visibility around corners and curves during low- and high-speed maneuvers, as well as when changing lanes or when reversing. The lamp fades in and out for seamless activations and transitions, and adds 60 percent more foreground width to the low beam’s pattern. The Dynamic Auxiliary Turn Signal provides an added degree of noticeable visibility by activating each auxiliary diode in sequential fashion, rather than all on, all off. Avalon’s LED taillights also implement laser ablation on Limited units, as well as Dynamic Auxiliary Turn Signal. The lamps’ three-dimensional Aero Fin Jet makeup insets the reverse indicator below the rear lamp, effectively widening the look of the housing, and in turn, the sedan’s muscular hips. Upon opening Avalon’s doors, an overarching simplicity and a purposeful placement of amenities and controls welcomes passengers. Authentic materials, such as the available Yamaha-sourced wood-trim and authentic aluminum pieces, accent arm rests, centre console, and instrument panels. Soft-touch materials are noticeable throughout – around the flowing, low-profile centre console decorated in piano black trim; on the slim, tiered instrument panel leading into the doors; in the rear compartment, where doors and console mirror the impressive craftsmanship seen in the front cockpit. A rear cup and device holder, accented in piano black and satin chrome-finish, folds up and down in the armrest between passengers. Ahead of their knees and within arm’s reach: air vents, controls for the available seat warmers, and essential USB charging ports. Deep curvatures in doors’ armrests provide passengers with ample surface area and comfort during long commutes. Rear seat roominess is exemplified by Avalon’s segment-best measurements in three categories: shoulder room (1,450 mm), leg space (1,024 mm), and headroom (952 mm). Material differentiation between grades is minimal; Limited features real wood trim. Aluminum pieces adorn XSE’s cabins. A mix of Perforated Ultrasuede wraps all seating in XSE. Limited goes beyond this creative approach by adding a quilt pattern, special perforation, and two-color stitches – all unique to Toyota. New-for-2019 Cognac coloured leather-surfaces highlights Limited’s upscale vibe. Joining Cognac in Limited’s color quiver are available gray and beige leather; XSE comes with black Perforated Ultrasuede. At the front seats, attentions are immediately fixated on Avalon’s slim centre stack. The thin panel houses Avalon’s 9-inch multimedia system (MMS) displaying audio and navigation, and integrates the automatic climate control system. Satin chrome decoration surrounds the centre cluster panel that “floats” above the instrument panel, further emphasizing the balanced aura of the modern atmosphere. Below the panel, passengers have easy access to the slide-open E-Bin containing a 12-volt plug and a trio of USB power ports (making for five total), plus, the standard wireless Qi mobile device charger. A part cup-holder, part phone cradle located atop the front console, sits adjacent to the gear selector; supple padding lines either side of the console’s lower tunnel at knee height. Past the steering wheel, a 7-inch Multi-Information Display (MID) shows vehicle information, turn-by-turn navigation, and various vehicle settings (including those pertaining to Lane Departure Alert with Steering Assist, Pre-Collision System with Pedestrian Detection, available Intelligent Clearance Sonar, Blind Spot Monitor with Rear Cross-Traffic Alert, and Head-Up Display). A new digital speedometer can be accessed by drivers. On the MID’s left, there’s a tachometer with long bright white needles and updated typeface. On its right, a speedometer. The tachometer and speedometer are surrounded by 3D Glow Rings. A chrome ring borders the entire meter cluster on all grades. Limited’s standard colour 10-inch Head-Up Display (HUD) – the biggest in the segment – clearly projects important info, such as vehicle and engine speeds, turn-by-turn directions, audio settings, and drive mode, right onto the lower portion of the windshield. It helps drivers stay focused on the road ahead, and is one third of Avalon’s “driver control zone” made of MMS, MID, and HUD. All of them align seamlessly for optimum communication between occupants and vehicle. Entune 3.0 Toyota Connected Services include Safety Connect. With a standard 14-speaker system – the most speakers in the segment - and Entune 3.0 Premium Audio, passengers seated within Limited grade are treated to unprecedented aural and visual stimulus and will enjoy embedded Dynamic Navigation. Hustle, athleticism, and fuel-efficiency. Each of these riveting traits has improved, in large part, because of a new punchy 3.5-litre V6 (2GR-FKS). The TNGA-derived V6 develops more power with less fuel consumption than ever before. Achieving the two took the application of D-4S direct injection, along with an updated VVT-iW (Variable Valve Timing-intelligent Wide) variable valve timing system. The most thrilling shifting experience, however, is reserved for XSE drivers, whose steering wheel-mounted paddle shifters up Avalon’s sportiness ante without question. The paddles give quick access to gear selection, and when downshifting, the gearbox automatically “rev-matches” for smoother shifts. Complementing Avalon’s daring looks is a thrilling drive personality imbued by an array of available sport-oriented tools – which together, represent a Toyota first. Intake Sound Generator (ISG), grade-specific exhaust baffle tuning, Active Noise Control (ANC), and Engine Sound Enhancement (ESE) fully exemplify Avalon’s most adventurous zeal ever. All Avalon grades receive a three-level drive mode selection (Eco, Normal, Sport). The new multi-link rear suspension allows for the enhancement of many positive performance attributes, such as a wider rear track, lower centre of gravity, and an aggressive stance. Revised trailing arms have been installed at a higher position to place the pivot axis of the tire rearward for better bump absorption. The setup’s shock absorbers are tilted forward, too, to realize a suppler ride. Bushings on the trailing arms and arm joints further mask passing road imperfections. 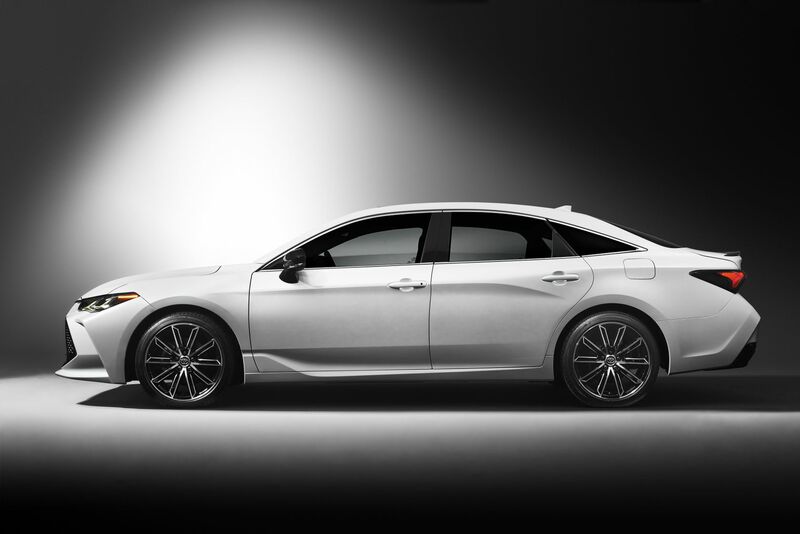 The 2019 Avalon takes full advantage of their innately sporty platform and multi-link rear suspension, and to them, add thicker stabilizer bars and stiffer spring rates for maximum handling dexterity. Avalon’s refined acoustic repertoire spans inside and out. Through Sport mode, passengers receive a concerto of exciting, natural sounds through a new exhaust system with sport modified baffles, an Intake Sound Generator (ISG), Active Noise Control (ANC), and Engine Sound Enhancement (ESE). ISG amplifies the engine’s air inhalation sound to create robust vocalization, and on the exhalation end, the all-new exhaust with baffle tuning ups the sound character at start-up, idle, and acceleration. ANC and ESE work to cancel any unwanted exterior noise while simultaneously augmenting engine sound via the JBL multimedia system’s in-cabin speakers. Exceptional engine notes at start-up are also enhanced; a hearty “flare” of sound occurs right before idle upon start-up. At wide-open-throttle acceleration, more engine grunt is heard throughout the rev range. For all its added energetic vocalization, Avalon never ceases to deliver a civilized, library-quiet interior, if desired. Road noise and engine droning have been culled, while cruising quietness and engine sound have been improved. Its TNGA platform utilizes additional seals where front fenders meet front doors, and where the doors merge at the B-Pillar. More sound absorption material is found in the engine bay, within the carpet pad, under the floor, and in the wheel well liners. The exterior rear-view mirrors not only reduce drag, but also wind noise, making for an extremely quite environment for all. TSS-P bundles cutting edge active safety technologies including Pre-Collision System with Pedestrian Detection (PCS w/PD), Full-Speed Range Dynamic Radar Cruise Control (DRCC), Lane Departure Alert with Steering Assist (LDA w/SA), and Automatic High Beams (AHB). Additional standard safety technologies include Blind Spot Monitor (BSM) with Rear Cross Traffic Alert (RCTA). Also available are the Panoramic View Monitor with Alert (PVMA) and Intelligent Clearance Sonar (ICS), which now includes a Rear Cross Traffic Braking (RCTB) system. For over two decades, Avalon’s sole manufacturing home has been Toyota Motor Manufacturing, Kentucky (TMMK) in Georgetown, KY. All Avalons sold in North America and around the globe are assembled in Georgetown by about 8,000 team members.